Games are the rare artworks that don’t presume an audience. There are players, sure, but players occupy a role somewhere between audience and creator. Put simply, they’re participants, and games are built with the participants in mind. If developers even consider an audience that just watches the action, it’s usually a minor afterthought. This is peculiar. Imagine if plays were written for the performers’ benefit, or if songs were composed only for the singers. Video games’ indifference to an audience leads to a profound artistic freedom: It’s common for games to have spots where nothing happens, because nobody is watching. If you want to pause for a while in Journey to stare at the grand arches in the desert, you can go right ahead. If Journey were something like a television show—with the expectation of viewers—that lapse in the action would be bizarre. That’s the funny thing about the hoary pow!-blam!-zoom! image of video games: One of games’ most distinctive qualities is their high tolerance for quiet emptiness. So we’re reviving the Special Topics In Gameology feature with a miniseries of essays about empty spaces. Periodically over the next couple of months, Gameological contributors will pay tribute to games that strip away the noise, because having some time to yourself in a strange world can be a profound experience. Nobody came to understand that better than Robyn and Rand Miller, the brothers who guided the creation of Myst (released in 1993) and its first sequel, Riven (1997). In the first game, they used emptiness to calm you; in the second, they used it to make you nervous. The original Myst placed you on a island filled with elaborate puzzles rendered in a gorgeous neo-Classical style—and no fellow travelers to be found. The emptiness of Myst was borne in part from technological concerns: Myst was created using a tweaked version of HyperCard, an Apple programming language that was well-suited for complex interactive stories. Although HyperCard was powerful in its own way, its typical end product was a glorified stack of index cards, so it didn’t render complex action that well. How do you create an immersive, lifelike experience without flash and movement? For the Millers, the answer was to remove enemies and keep the supporting characters to a bare minimum. They focused instead on the world, with great success. 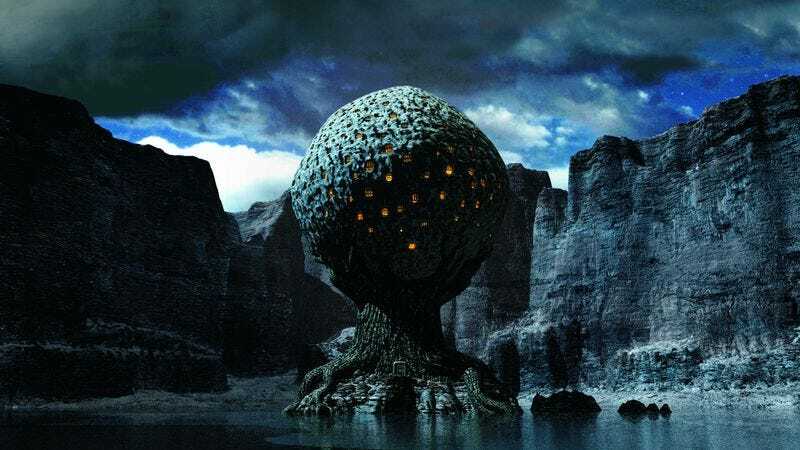 Myst offers a predictable explanation for the desolation of its strange lands: Once, this place was happy, and then something went awry. The game instills no urgency to right this wrong. Yes, you encounter two brothers who each are imprisoned in special “linking books,” and they’re eager for your help. But it’s clear that these bookish sorts have been stranded for a while, so letting them rot for a few days more won’t make much difference. Riven is almost as lonely as Myst, and its empty spaces are used to largely the same effect. Yet the sequel differs in one important respect: Riven lets you see the edges of its emptiness. Instead of the choppy, book-bound dialogues of the original, Riven features a handful of tantalizing encounters with other human beings in the flesh. When you land on Riven, a stranger takes your linking book—and then another one steals the book from him. As you near a village, a lookout sounds an alarm and flees. In a haunting moment, you can knock on a door in that village to see a native peek out at you and return to hiding. Keep knocking all you want—I imagine most players bang on the door for a while—that person will never come back. The deserted landscapes of Myst predate your arrival. But in Riven, you appear to be the unwitting catalyst of your own loneliness. There’s a halo of emptiness that follows you, with traces of life dancing at the edges. Those traces don’t spoil the solitude that Myst established; Riven is still careful to let you investigate the realm in your own time. The fleeting glimpses of humanity, though, naturally create an urge to meet some of these folks. Why won’t they be your friend? That’s for you to figure out. The emptiness that was taken as a matter of fact in Myst is part of the puzzle in Riven; it enriches the tensions of the game. Those skittish villagers on the periphery are the embodiment of an itch that you can’t scratch. Therein lies the special brilliance of Riven’s empty spaces. They’re used to calm you, as in Myst, and at the same time, they’re also used to provoke you. There’s a subtle threat beneath the surface of your enforced loneliness, too. Both games feature characters who share some version of your isolation—the scheming brothers in Myst and the destructive father figure Gehn in Riven. All of them are quite deranged, driven crazy by their extended isolation. As you dwell on an infuriating puzzle for the umpteenth hour, with nothing but your own thoughts to keep you company, you might think of those broken minds and consider Riven’s most potent threat: Maybe you’ll end up like them. Placid by one turn, maddening the next. Emptiness is more versatile than it might seem.